6666 BC - Happy Birthday, Satan! 6665 BC - Happy Birthday, Santa! 6 - Computer geeks begin to worry about the transition to two-digit years, doomsayers proclaim the end times and the birth of Anti-Jesus. 1670 - The fourth dimension is discovered in Detroit. 1671 - The scientist who discovered the fourth dimension dies inside it. 1689 - The Bastille is stormed. 1690 - The person who wrote the above entry rebuilds it. 1789 - Sidcup is built in Margate. 1890 - Sidcup is moved to its present location. 1893 - Sidcup is demolished. 1894 - Sidcup is rebuilt as a town. 1900 - Centennial celebration of dinner time. 1966 - 23 people visit McDonald's, only to find Wendy's replaced them. Arby's sues them for no reason. 1987 - The physical embodiment of the god of whores is born in a small general hospital in London to a family with too many cats. 1998 - Satan builds the Flex capacitor, but nobody seems to care. 1999 - The Millennium Dome sneaks off to the Bell and Dragon in Bath for a pint. 2001 - John The Baptist meets Jesus in the local Blue Peter Bring & Buy sale. He opts to buy the cross Jesus is carrying, but turns it down in favour of a My Little Pony annual. 2002 - Pie is eaten. 2003 - World shortage of pie day. Millions commit suicide. 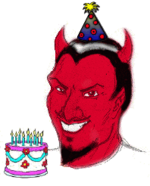 2006 - The day of Satan, and my ex-wife's birthday! Coincidence? This page was last edited on 31 May 2012, at 06:41.